Very Very Vicky: A Room for Dreaming! When we finished up the decorating at Coast Awhile Cottage it was immediately rented to a wonderful family who needed a great big house so they could all be together when they came into town to say their final goodbyes to their mother/grandmother/great-grandmother who had passed away. Their kind notes in the guestbook brought tears to my eyes as they wrote of what a sweet time they had being together, drawing strength from one another and yet having space to be alone when needed. They said the beauty of the house was "magical" and really ministered comfort to them as they took pleasure in their surroundings. I couldn't ask for more. This feeling has been my goal in decorating our beach cottages--to bring peace and healing and rest and togetherness and comfort and delight to those who enter. More than paint colors and furniture and accessories in a pleasing arrangement--it's a feeling of welcome and that someone has counted you worthy of being prepared for and fussed over a bit. A feeling of a beloved home where beautiful things were meant to be enjoyed and used. .....comes from their "happy colors" as my designer Jane Coslick refers to them and part is due to the interesting mix of vintage and new. Not too shabby and not too chic. The predominant colors in this room are blue and green. 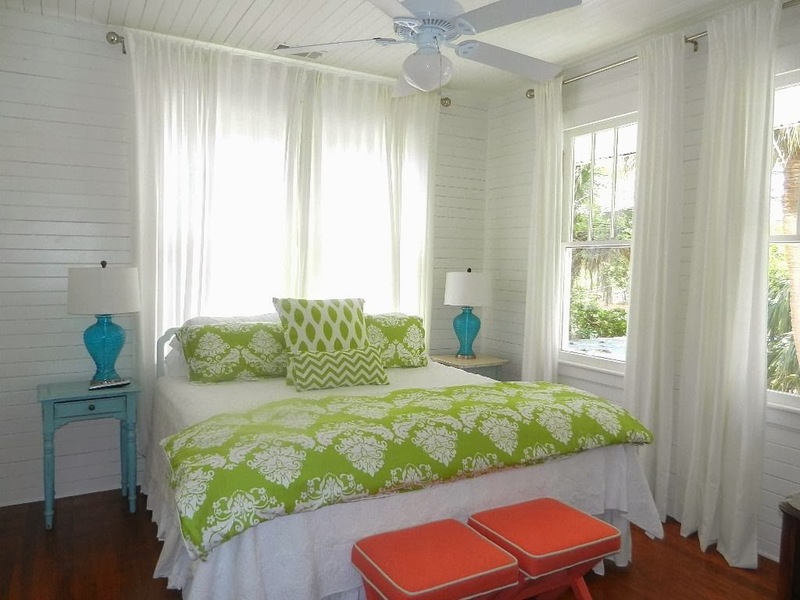 Jane added a pop of eye-catching color with the two coral colored benches at the foot of the bed. I love how it turned out! I think I would have sweet dreams in this room!